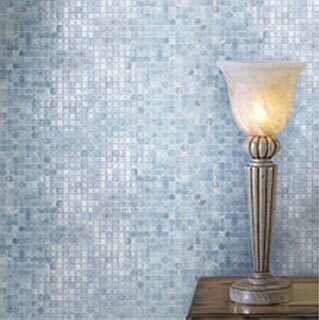 The Calliope series glass tile line adds a touch of light and air to any space. Like a vase of fresh flowers, this colorful glass tile rejuvenates its surroundings. The garden-inspired colors have a slight iridescent sheen, adding soft radiance to any application. The translucent and opaque glass tiles have delicate swirls of color throughout, giving them a beautiful blended look. This glass tile, with the iridescence, dances in a variety of light settings, from indoor to outdoors. The Calliope Glass Tile line from Hakatai will add a vibrancy to your setting of choice. Choose from the nine glass tile color chioices and watch your space come to life. Glass Tile Size: approx. 5/8" x 5/8"
All glass tile in the Calliope series is comprised of approximately 50 percent glass from bottles and/or other waste glass that would otherwise have entered the solid waste stream. This waste glass is a mix of approximately 90 percent post-consumer and approximately 10 percent pre-consumer material.